Cat 4 we say, because saying cat instead of category makes us sound cooler. A little tropical weather inside baseball tonight. I’ve been spending lots of time with Hurricane Igor. You would expect that. It might threaten Bermuda over the weekend, but right now it’s all alone out in the wide open ocean. Top sustained winds are estimated at 155 mph with higher gusts. Cat 4 we say, because saying cat instead of category makes us sound cooler. SO THE OFFICIAL FORECAST MAINTAINS THIS INTENSITY FOR THE NEXT 12-24 HOURS. GRADUAL WEAKENING IS EXPECTED THEREAFTER WHEN IT IS LIKELY THAT INTERNAL DYNAMICS…WHICH ARE NOT WELL UNDERSTOOD…WILL INFLUENCE THE INTENSITY. In essence NHC is saying Igor will weaken… just because. When a hurricane reaches 155 mph there’s only so much faster it can spin. It’s possible for hurricane speeds to reach 200 mph, but that’s very rare. In reality there are many, many more factors that can diminish the storm than can intensify it. Betting on a 155 mph storm weakening almost always wins. 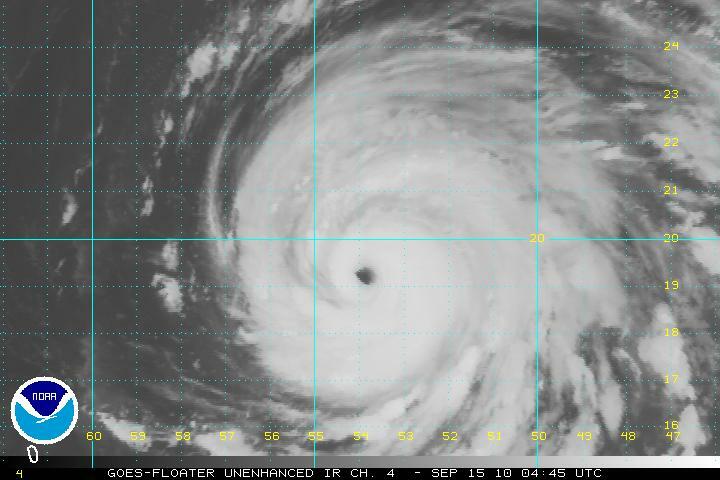 The Hurricane Center knows there’s only so long any storm can maintain this nearly perfect form. At some point something… anything will intrude. It doesn’t have to be a major factor to upset the balance and lessen the storm’s efficiency in maintaining strength. It always happens. At some point the water temperature will be a little cooler or there will be a frictional force from some other nearby weather feature. Of all the things the Hurricane Center predicts wind speed is most problematic and subject to the largest errors. NHC is betting on climatology or what’s happened before to predict what’s going to happen now. That’s reasonable. Out in the open ocean the downside to guessing wrong is less.